Wire guards control traffic, segment off security areas and keep larger flying debris from leaving the machine workplace. They are easy and quick to install, and are not effected by power outages or electrical issues like safety light curtains are. Wire guards usually enclose automated and robotic machinery, tanks, heavy equipment, motors and spiral HVAC fans. They are used both indoors and out, and are usually over six feet tall to prevent individuals from climbing over the barrier. Besides protecting workers from accident and injury, wire guards also prevent unauthorized personnel from entering certain work zones, as well as lower the risk of tampering and vandalism. Unlike other forms of machine guards, wire guards are an effective way to alert workers to the existence of potentially dangerous machinery. They are often painted bright colors like orange or yellow and have warning signs hung from them. Installation of wire guards is quick and easy. They are almost exactly like fencing, only with more gauges and weave options. The wire may be welded at the cross points or interweaved in a number of different patterns. The wire mesh is sold in panels, which are attached to poles. The poles are permanently mounted to the plant or factory floor. 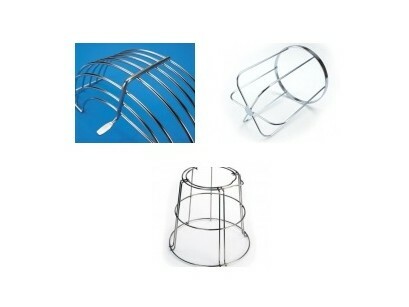 Wire guards have many different size and shape options, and can enclose machinery of literally any size. Most wire guards include a lockable door. Some doors have electrical interlocks, which shut down the machine if opened because maintenance is always necessary. To improve corrosion and rust resistance as well as strength and durability, the wire mesh is often galvanized, a process that coats the metal in molten zinc. The zinc reacts with the metal, either steel or iron, and forms an alloy coating on the surface. Smaller wire guards also often protect clocks, lighting and electrical signage from damage. They are not made for applications that require full visibility. Instead, they are composed of thin metal wires that make up a large pattern of holes, which vary in size according to how much visibility is necessary.